The clouds are gathering above a city street and soon — tap, tap, boom, boom! As a thunderstorm rolls in, people of all stripes race down to the subway to get away from the crackling rain and wind. With quirky wordplay and infectious rhymes, Elizabeth Bluemle crystallizes an unexpected moment of community, while G. Brian Karas’s warm illustrations show the smiles to be had when a storm brings strangers together as friends. Elizabeth Bluemle is the author of How Do You Wokka-Wokka? and My Father the Dog, both illustrated by Randy Cecil, and Dogs on the Bed, illustrated by Anne Wilsdorf. Elizabeth Bluemle lives in Vermont, where she co-owns the Flying Pig Bookstore in Shelburne. G. Brian Karas has illustrated more than ninety children’s books, including two books about Ant and Honey Bee by Megan McDonald; Switching on the Moon: A Very First Book of Bedtime Poems, edited by Jane Yolen and Andrew Fusek Peters; and the New York Times Best Illustrated Children’s Book Are You Going to Be Good? by Cari Best. G. Brian Karas lives in the Hudson Valley of New York. 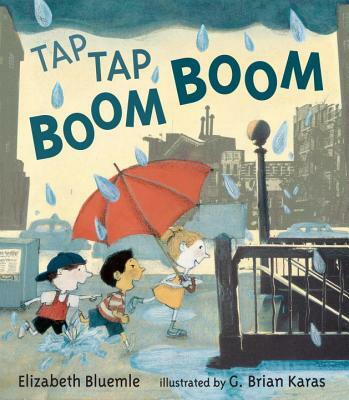 'Tap Tap Boom Boom' offers a smaller, anecdotal slice of New York life... quotidian but magical, the kind of interruption in routine that might loom large in a small child's eyes and is rendered evocatively here. G. Brian Karas's illustrations, which combine drawings and photographs, capture the crazy yellow light of a summer storm while the onomatopoetic title, used as a refrain in the text, renders the sound of big, juicy raindrops splattering on concrete as thunder cracks overhead. In toe-tapping, jazz-chant verse, author, bookseller, and PW blogger Bluemle writes about the way a sudden thunderstorm “makes friends/ of strangers.” ... Bluemle’s story unfolds on a scale just right for preschoolers, with plenty of hullaballoo, subtle attention to the senses, and an affirmation of the way misfortune can lead to small miracles. Bluemle employs bouncy, fast-paced rhymes and rhythms with words that emphasize sound and movement. ... The text, appropriately varied in size and boldness to match the storm’s activity, moves across mostly double-paged spreads and intermingles with the illustrations. Karas ... sets gouache and pencil drawings within collages of photographs of New York City. ... The ethnically diverse characters are animated as they head for the subway stairs, and there are delightful details to elicit giggles from young readers. Cuddle up for a rainy-day adventure. Children will enjoy following the various characters as they put up umbrellas, splash through puddles, and run for cover down the subway stairs... Karas’ colorful, detailed, and lively pictures—created using photographs, gouache, and pencil—are the perfect vehicle for Bluemle’s succinct, catchy rhymes that energetically describe a sudden rainstorm in the city. Karas’s winsome, multicultural caricatures inhabit a neighborhood that appears lifelike due to his use of photographs for buildings and subway details. As children and adults dash between the showers and thunderbolts to the safety of the underground station, Bluemle’s taut, clever verse propels the plot: “Feet wetter?/You’d better/go down/underground,/where the water/can’t getcha./You betcha.” ... This upbeat rendition of a common experience will have universal appeal. Don’t wait for a rainy day to share the fun. The sonorous language of Bluemle’s rhythmic text makes it a pleasure to read aloud... Karas’ illustrations—a mixture of photographs, gouache, and pencil—are as expressive and detailed as always, and the combination of media expertly captures both the energy of a big city and the quietness of a pause in the commotion. The poetic rhythm of the language mimics the stages of the storm and the tempo of the citizens’ footsteps. Though minimal, the text is powerful, and works well with the illustrations to create positive feelings about the weather. Grey, brown, and black dominate throughout, surrounding the reader with the feel of a messy, urban thunderstorm; however, the overall connotation of the story is upbeat. This story begs to be read aloud and is sure to have young readers booming and tapping along. Elizabeth Bluemle's simple, musical rhymes and G. Brian Karas's photo, gouache and pencil collages capture the way a thunderstorm in the city unites a community. ... A rainy day delight. Illustrator G. Brian Karas places readers right in the center of the action. Combined with Bluemle’s immediate, first-person sentences, it’s as if we’re in danger of getting soaked ourselves. The collaged photos of city scenes—along with Karas’ gouache and pencil additions—make for intriguing textures and add concreteness to this warm-hearted story of community. ... This is one storm readers will be pleased to participate in.